Regional Rail passes for Thursday's Eagles parade were scarce in the suburbs on Wednesday. 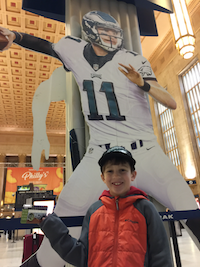 The ticket booth at 30th Street Station was a last bastion of hope for many fans. The whole predicament could have been easily avoided. Hadn't my family moved to the burbs this summer – or had I remembered to purchase those one-day SEPTA Independence passes on Tuesday before hopping the train home – than Wednesday morning wouldn't have kicked off in a frenzied panic before the sun even rose in sleet-spitting skies. After my city – well, region, actually – waited more than a half century for the parade that's going to turn America's birthplace into a gargantuan sardine can of bacchanalia, why should anything be easy, right? It all started just before 5 a.m.
Tossing and turning in bed when I should've been sleeping, I grabbed my phone and gave Twitter a peek. It was there that I saw a tweet from a college friend who happens to be the anchor of 6ABC's morning news. 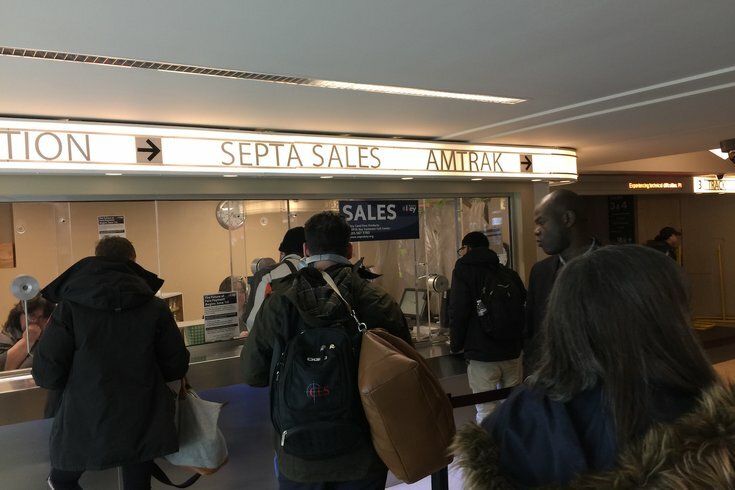 "Action News is hearing several reports that Septa regional rail stations are running out of Eagles parade passes this morning," read the alert from Matt O'Donnell. I looked out the window, saw an icy sleet coating both the car and driveway and tried to catch a few more ZZZs. Yeah, no. A half-hearted effort to grab another hour of sleep failed. At 5:41 a.m., an email arrived: There's a two-hour delayed opening. Sweet. I jumped out of bed, and ran upstairs. "Louden, Louden, you gotta get up," I said to my initially noncompliant 7-year-old son. "Train tickets are selling out. We gotta get to Fort Washington, like, now." The delay had offered a window of opportunity. It took but a few minutes for him to hop out of bed and throw on a Sixers sweatshirt, sweatpants and his brand-new Super Bowl Champion Eagles lid. Out the door we went onto an ice rink of a driveway. We got to the station around 6:05 a.m. Hazards on in the closest parking spot to the ticket office, we ran inside. "They're all sold out," the cashier told use, a tinge of pity in her voice. "They told me they're delivering more at 9." Back home we went. What to do? There's no way I was letting my son (or readers, since I'm assigned to cover it) miss this parade. Emails went out to friends in East Falls and Fairmount: Yo, we might need to crash at your place tonight. Sorry bro, our guest room's already filled with people who planned better than you (the last five words, mine) came one response. No can do; staying at my sister's in South Philly came another. Then, at 7:14 a.m. came another alert from the district: School's closed today. An all-but-instant sprint out the door for the father-son duo. Let's just get back to the SEPTA station and wait until 9 a.m. Maybe the tickets will get there earlier. Worst case scenario: You can just mess around with the iPad for an hour-and-a-half or so or we can talk about how gutsy it was to call the "Philly Special" on fourth and goal. A mad dash to secure train tickets for Thursday's Eagles parade was quite a challenge early Wednesday morning. Lo, when we got back to the station, we received a dire message: Sorry, they just called and told me that they won't be bringing any more tickets here; they said go to Lansdale or Doylestown. Pfft. I'm new around here. All I know is they're the names of the towns on the Regional Rail route. C'mon, gimme something to work with here, SEPTA! Back in the Twitter world, the transit authority's social-media account was already inundated with stories of similar peril. Their suggestion to suburbanites looking to make their way into the city for the biggest parade in its history? Head down to Jefferson, Suburban or 30th Street stations. They'll probably have some still. Greeeeaaaaat. That's, like, super logical. Do we roll the dice and speed along icy roads for the right to wake up tomorrow and get in line for a train at 5 a.m.? Yep. I mean, they're predicting they'll be sold out of tickets by noon. Do we turn back when a friend emailed to say we could crash at he and his wife's house not too far from the Art Museum? Nope. We've already come this far. The ticket office at 30th Street Station is but eight minutes away, according to Waze. About 20 minutes later (unexpected traffic, because of course there was), me and the lad slid into a parking lot across the street from the train hub, clenched hands while nearly falling on the icy pavement a few times, sprinted into the building, up the ramp and toward a ticket window where we landed in a line about 10 deep. "I hope we get these tickets!" I said. "Don't worry. I think we will," my son responded as I texted my wife at work to let us know we'd made it there safely. "He's right. They have enough here," the woman in front of us chimed in. After a perilous Wednesday morning journey, SEPTA Independence Passes were procured for Thursday's Eagles parade. He, and she, were correctamundo. "You're like Santa Claus, the Easter Bunny and the Tooth Fairy all rolled into one," I told the woman behind the counter as she handed us our train passes. She smiled at us with an expression that indicated we weren't the only people to see ticket agents as historical saviors, if only for one day. "Yeah," she said, "it kinda does seem like that, doesn't it?" 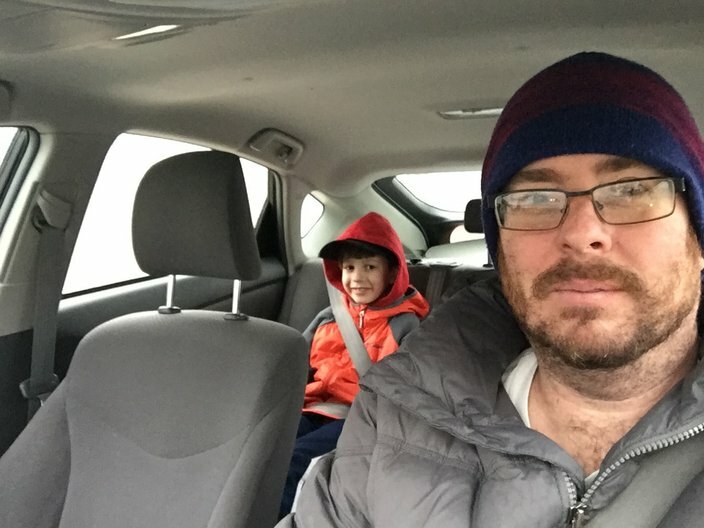 After snagging an Eagles flask (for daddy) and water bottle (for son) at a stand set up at 30th Street, we were off to stash our car in Fairmount to avoid any post-parade maelstroms of waiting for a lift home. We got back to the burbs about five hours after the quest started. It was worth every second of it. Here's hoping anybody else facing a similar predicament comes out of it as happy as we did.